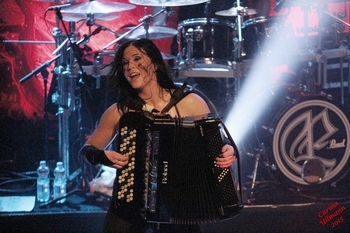 Netta Skog is probably mostly known due to her playing the accordion with Finnish „Battle Metal“ band TURISAS. She had left the band years ago and now is focusing on her own music and education, but is replacing ENSIFERUM´s Emmi Silvennoinen on the “One Man Army“ European tour this spring (which will continue in the US and Canada in May, check the band website for tour dates). 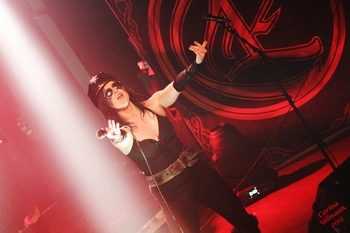 I used the chance of having her in town to sit down with her in the tour bus, asking her about her life after Turisas and the tour with Ensiferum. How are you doing today, Netta? Do you actually know in which city you are right now? Do you always know that when you wake up in the tour bus or ...? (laughs) No, absolutely no... but at least now I do! So how come that you´re now on tour with Ensiferum? How does it feel to be also singing and not “just” playing accordion? It´s awesome, it really is! 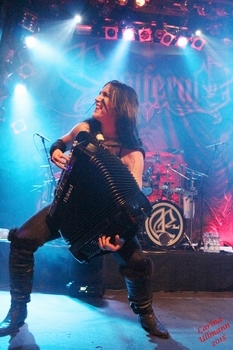 It´s like –all these heavy metal people know me playing accordion, so now I will surprise them with singing. It´s good. So how were the reactions like so far? When returning home from this tour, what´s the plan for the rest of the year? Going home after one more week, then we will be at home for one month and then we are going to the US for around one month. And then there is summer festivals, I don´t know which ones I´m gonna do but...maybe. You posted on Facebook a while ago that you are working on some own material...what about this? What can we expect and when is something coming? Let´s look back at Turisas times – you stated that you also left the band because of school. What are you going for in that matter? Actually, I graduated already! I wanted to have a secondary education – all I wanna do is music, of course, but you never know, so ... I went to school to be a confectioner/baker. I´m doing cakes...At first it was a hobby but then I graduated and now I´m a musician and a baker! Yeah, I know (laughs) I have no idea how I chose that...At some point I started baking at home and thought “ah yeah, this is quite nice!”, then went to school and graduated. So did you ever regret that you left Turisas? Yeah exactly. Because I am a female, yeah. (laughs) But yeah, it was a hard decision, but I had to make it. Still love them, still love them from the bottom of my heart. Talking about music – You took part in the Tango competition in 2013 and you made it to the finals...What kind of an experience was this for you? Oh yeah...weird...It was a once in a lifetime experience, and never again. (laughs) I mean, it was really good, but it was not my thing at all. I just wanted to try it and it went well. I succeeded but but...but I think Heavy Metal is my thing. Don´t ask, don´t ask that, because I don´t know. But it was fun, I got new friends and experience and publicity. Basic stuff. It was a good experience, but never again. Never again. Not in a bad way, but that was then and now is now, you know. Competitions in general or just the Tango direction? On these shows, do you happen to see known faces from e.g. your time with Turisas, or is it a totally different audience? 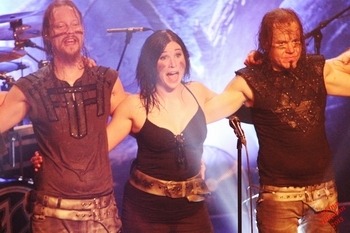 No, actually there were a lot of fans from Turisas times. So not just only accordion people. So how was those fans´ reactions like? Oh, they were excited and “oh my god, this is so coo!” – yeah, it is. (grins) It was a good reaction. Over old times, and your music, let´s get back to this current tour. Are there any fun stories on what happened so far? Yeah...there are...I think I am not allowed to tell them...hm. (thinking) Well, I´ve been laughing so much, but I don´t know why. (laughs) Is there anything really funny...No...nothing special. Just like – basic touring madness. Yeah. It´s been a really good tour, best ever. Which city did you like best so far? (grabs her pass to check cities) I think Z7, Pratteln, it was really good, oh my god. And then...I can´t remember...(desperate staring at the pass) Well, Pratteln was good. Actually there were many shows that were really good, but there has been no bad show. Every show has been “yaaaaaaaaay” – I´m having so much fun! Every night! Are there big difference between the crowd, e.g. Germany compared to Finland? Of course there are some differences, but basically it is all the same. Everyone´s really enthusiastic, good, singing along and having mosh pits and walls of death. Basically it is the same everywhere. But sure, Finland is our home country, so it is always the best crowd. Are you into the same kind of music also in your free time or is it just for making music? I suppose you didn´t have much of a chance to actually see anything of the cities you played in? So what are the three things that you always have to take with you on tour? Accordion... my phone...ok, also except for that as well...hm. (thinks and laughs) I don´t know! What did I pack? Clothes. Just clothes. Shoes. Only two pairs. My jogging shoes and these that I wear now and then I bought new shoes...Nothing special, really. Just clothes, hairspray and make-up...just the basic stuff. Did you forget to pack anything? Have you always been that talented, also when starting to tour with Turisas or was it all about learning? Have the feelings about touring actually changed over all the years? Hmhmm, yeah. I don´t know how I will survive. Ah well, only one month to be home and then back to the bus! So what will be the first thing to do when you return home after this tour? Are you actually doing many interviews? Actually...on this tour none, this one is my first one. And then our tour manager told me “You´re gonna have an interview!” (excited) – “Whaaaat? Meee? ” - “Yeah yeah yeah! She didn´t want anybody else - just you!” – “Alriiight...”. (laughs) It felt really good, my very first Ensiferum interview! So thank you for this opportunity! Alright, I think it´s time to end this nice conversation – anything left to say to our readers?